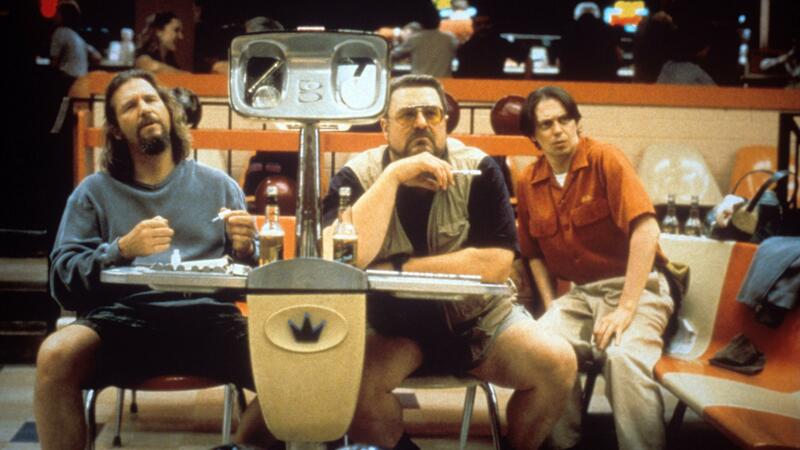 Jeff Bridges, John Goodman and Steve Buscemi portay bowling teammates The Dude, Walter and Donny. And so it is that this week, the Coen brothers' masterpiece — yes, I'm declaring and defending its status as a masterpiece — marked 20 years since it first hit the theaters. It didn't exactly win rave reviews upon its release. But its lead character, who spends a good chunk of the film in his shorts and an open bathrobe and who drinks milk right out of the carton in the dairy aisle at the grocery store, has become one of the cinema's most beloved anti-heroes. He ambles through life with no ambition, except for trying to get reimbursed for the rug — one that "really tied the room together" — that a pair of thugs soiled while ransacking his less-than-modest apartment in an act of mistaken identity. Is there a lasting lesson from such a character now, two decades later? The Big Lebowski came out in the days before smartphones and Twitter and YouTube and push notifications. But even then, it recognized that we all needed to slow down just a little bit. To just chill. That is what The Dude taught me. Now, as I sit here in the year 2018, I can truthfully tell you that I didn't listen. I think none of us did. But we can still try. Go to the bowling alley. Catch up with an old friend, like that guy at the bar with the cowboy hat and the deep voice. Oh. One other thing about The Dude. He never liked the band The Eagles. Though he said so in somewhat cruder language. The Dude abides. OK. As iconic movie lines go, maybe it's not as iconic as here's looking at you, kid. But for fans of the film "The Big Lebowski," there are few things better than hearing Jeff Bridges say those words with such slacker indifference. And so it is that this week, the Coen brothers masterpiece marked 20 years since it first hit the theaters. It didn't exactly win rave reviews upon its release, but its lead character, who spends a good chunk of the film in his shorts and an open bathrobe and drinks milk right out of the carton in the dairy aisle at the grocery store, has become one of cinema's most beloved antiheroes. He ambles through life with no ambition, except for trying to get reimbursed for that rug that a pair of thugs soiled while ransacking his apartment. Is there a lasting lesson from such a character now two decades later? "The Big Lebowski" came out in the days before smartphones and Twitter and YouTube and push notifications. And even then, it recognized that we all needed to slow down just a little bit, to just chill. That's what The Dude taught me. Now as I sit here in the year 2018, I can truthfully tell you that I didn't listen. I think none of us did. But we can still try. Go to the bowling alley, catch up with an old friend, like that guy at the bar with the cowboy hat and the deep voice. SAM ELLIOTT: (As The Stranger) Howdy do, Dude? JEFF BRIDGES: (As The Dude) You know, strikes and gutters, ups and downs. ELLIOTT: (As The Stranger) Sure. I got you. BRIDGES: (As The Dude) Yeah. Thanks, Gary. Well, take care, man. Got to get back. ELLIOTT: (As The Stranger) Sure. Take it easy, Dude. BRIDGES: (As The Dude) Oh, yeah. ELLIOTT: (As The Stranger) I know that you will. BRIDGES: (As The Dude) Yeah. Well, The Dude abides. GONYEA: Oh, one other thing about The Dude - he never liked the band The Eagles, though he said so in somewhat crude language. So let's go out on one he did like. TOWNES VAN ZANDT: (Singing) Send me dead flowers every morning. Send me dead flowers by the mail. Send me dead flowers to my wedding. And I won't forget to put... Transcript provided by NPR, Copyright NPR.